The mile is an infamous obstacle that would normally scare people away, but for senior Taylor Parker those words mean a chance to push herself beyond her comfort zone. 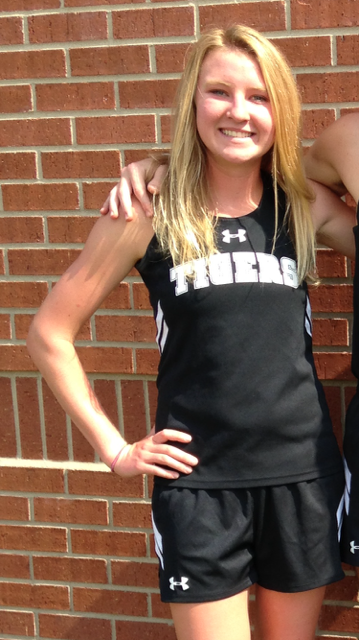 Taylor has known from a young age that running, for fun and competitively, is a way to better herself as an athlete and is a way to escape the stressful reality of being a senior. On top of AP and TCC classes and extracurricular activities, Parker still manages to find time to practice and improve her passion to run. Parker prides herself on her tenacious personality and because of this she pushes herself to practice more in order to improve her times. “My fastest 1600 meter is five minutes and twenty-four seconds, 3200 meter is eleven minutes and thirty-one seconds, and 5K is twenty minutes and two seconds,” said Parker. Running as much and as fast as she does, one would expect that Parker comes from a family of talented runners. However, her drive for this particular sport is a gift that is unique to her despite her family’s lack of love for running. “My mom used to run in high school, but wasn’t very good and doesn’t enjoy it as much as me,” said Parker. Even when competing, Parker never ceases thinking. “Sometimes I do math and based on the splits I’ve run so far what my overall time would be. Other times I just think about random stuff and then have to remember to just focus on running,” said Parker. The secret to Parker’s ability is honestly an easy one. To any new runners out there, Parker suggests that starting small and working up to that final goal is the best way to go. “It will be hard at first, but just start slow and with a mile or two and build up and get faster,” said Parker. Throughout her high school experience, Parker’s favorite memories have come from her cross country teammates and meets. She has consistently been recognized for her character and running ability on and off the track. Parker has been accepted to Texas A&M and will live out her other passion of majoring in education, to hopefully become a teacher, coach, or athletic trainer. However, her runner’s spirit will never die as she promises to continue to run, on her own, in college.